First Tuesday in November – Melbourne Cup Day! Yes, a day off work to go to Flemington and watch or to sit at home (or elsewhere) and watch on a screen big or small the highlight of the Spring Racing Carnival. Usually accompanied by a drink or two and lots of goodies to eat. It was cool overnight then dry and sunny which was good because there aren’t that many horses that like running two miles on a wet track. Final result was Prince of Penzance won, and get this, had a female jockey. 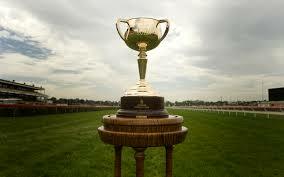 Yes, for the first time the Cup (first run in 1861) was won by a horse ridden by a woman. There were some lucky punters as well, odds were 100/1 so if you handed over $5 you’d come away with $500. No such profit for me though, my days of looking at the odds and placing a bet have long gone now. Watched the race at 3pm then picked up ‘me knitting needles’. I’m only at chapter 13 in the book so looking forward to another few hours to find out how it finishes. Something that got me thinking about though was the use of the word ‘perfectly’ that cropped up quite a lot in the early chapters – perfectly beastly, perfectly terrible, perfectly dreadful, perfectly all right – I’ve been wondering whether kids use a word in that fashion all the time these days. Maybe ‘absolutely’ – what do you think? This entry was posted in Books, Daily Life and tagged books, c s lewis, lion witch and wardrobe by Cathy. Bookmark the permalink. I wish the Stanley Cup was a daytime event and we got a day off work for it! I grew up reading the E. Nesbit books (Railway Children, Five Children and It, etc.) and they used similar language. I read so much, I’m surprised I didn’t end up speaking that way. The changes in language over time are truly interesting. I’m not sure that I like much of the mod stuff, however. I love CS Lewis, however! Next you must read The Screwtape Letters. I’ll have to look for that at the library – i belive it’s something he wrote about ‘good and evil’. Is that right? Read about the female jockey! Perfectly sounds very British. Glad the winning horse had a woman jockey. Great news! I don’t read books anymore, just articles in the media. Do you limit the size of the articles Gigi – one page or more? Any particular subjects? Some interesting writing in today’s Age about Cup speeches failing to focus on the significance of a female jockey rodding the Cup winner. I can’t think of any other popular words. Absolutely is certainly one. I think, “perfectly happy” is still quite common. As kids we certainly “bagged” things and called people “batty” and “nutty”.